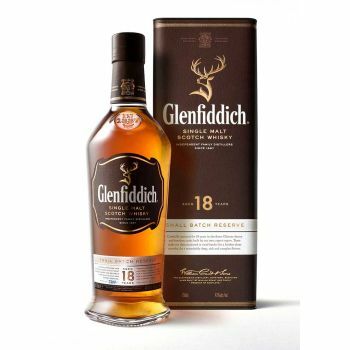 GlenfIddich 18 Year Old is testament to the art of the craftsman. The complex character and sublime mellowness come from the long years of maturation in the finest Oloroso Sherry casks and traditional Bourbon casks. The resulting touch of sweetness from the Sherry wood is perfectly balanced by the oakiness drawn from the traditional casks, delivering a single malt Scotch whisky of brilliant character – smooth and full bodied.